The report below was first posted by Payvand News of iran on December 27, 2004. Experts studying the structure of Falak ol-Aflak castle have come to realize that the Sassanid engineers equipped this ancient castle with a dehumidifier system to prevent humidity penetrate into its foundations. 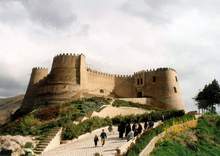 Falak ol-Aflak castle along with Shapoor-khast fortress is among the most important structures built during the Sassanid era. The architecture of this ancient castle is so outstanding that the experts believe it deserves being included in the world heritage list. “We have found some canals beneath the structure between the stone and rock strata that, according to our studies, are dehumidifiers”, Abdol-azim Shah-karami, an expert in geotechnique responsible for engineering studies in Falak ol-Aflak, told CHN. Falak ol-Aflak castle is made with different materials like stone and wood that are so vulnerable to humidity. That’s why, according to Shah-karami, the castle was built on the highest point of the city of Khoram-abad, so that the wind could penetrate the building and dry its foundations. The historical castle of Falak ol-Aflak with 8 towers, one of the architectural symbols of Iran, shows off on top of a hill with the same name. It dates back to the Sassanid era and has been continuously restored during the Islamic period with its general form mostly preserved.